please contact us for further information on titles. � A unique collection of maps from the last 150 years of Times atlases will be included in a historical mapping section. This feature is a first for world atlases and will dramatically illustrate the rapidly changing world we live in. � The latest satellite images will be showcased in the imagery section with 32 pages of stunning images. � Updated plans of 32 of the world's great cities are also included. � Geographical reference section with flags, statistics and facts for all the world抯 countries. � Comprehensive index to over 50,000 place names. Backed up by numerous charts, graphs, tables, satellite imagery and thematic maps, this school atlas provides highly detailed mapping of the world. The material has been updated for the 94th edition and is designed for use in the classroom or at home. 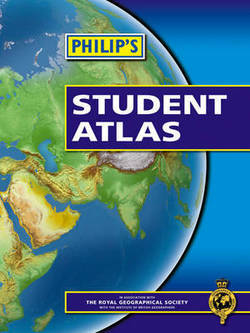 "Philip's Student Atlas" has been specially created for lower-secondary geography students (11-14 year olds). It is ideal for work leading up to GCSE (England and Wales) and Standard Grade (Scotland): National Curriculum Key Stage 3. The maps have been carefully designed so they are uncluttered and easy to read, containing specially selected place names and detail. A clear set of symbols and scale information accompanies each map and there is a useful introductory section covering basic atlas skills, including aerial photographs and satellite images to further explain particular features on the maps. Fully up-to-date, the atlas comprises a 16-page UK and Ireland section and a 42-page World section. Detailed regional maps, charts and satellite images of Europe, Italy, the Middle East, China, Japan, Kenya, USA, Brazil, and the Arctic and Antarctica are included, focusing on areas of special interest for students of geography, such as Japan's volcanoes and earthquakes, conservation in Kenya, and water supply in the USA. "Philip's Student Atlas" is ideal for special project work, featuring an informative section of world thematic maps on the environment, climate change, people, quality of life, and energy. Latitude and longitude co-ordinates are included in the index, alongside figure-letter references. With 96 pages of authoritative world maps, a comprehensive index, 69 city maps, and a thematic section providing information on topics covered in geography, humanities and economics courses, Philip's World Atlas is recommended for students as well as for general home reference. The 96 pages of physical and political maps give a balanced coverage of the world at well-chosen scales. The hill-shading on the physical maps provides an exceptionally vivid portrayal of landforms. The 32-page introductory section - 'The World in Focus' - covers key geographical themes such as the Earth's position in the Solar System, the structure of the Earth, climate and weather, the environment, population, resources, economics and international organizations. The 48-page 'World Cities' section provides urban-area and city-centre maps marking tourist sites for 69 of the world's most important cities, backed up by a comprehensive index. Full-page satellite images for 9 of the cities featured complete this section. The 35,000-name index includes geographical features as well as towns and cities, with both letter-figure grid references and latitude and longitude co-ordinates.